Perfect for the summer or any time of year! 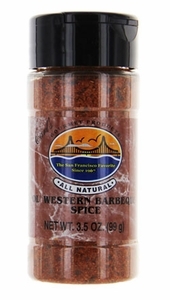 Old Western Barbecue Spice Seasoning. Whether its summer time or anytime, your low carb lifestyle demands that any meal you make is not just good, its great! The best way to make a good meal into a great one is to use Carl's Gourmet Meat Rubs and Seasonings. These delicious meat rubs enhance the flavor and tenderness of all kinds and cuts of meat. These spice blends and seasonings will improve the flavor of all of your favorite dishes and salads. Try all four flavors. Sprinkle generously on both sides and ends of meat. Cook in usual manner. 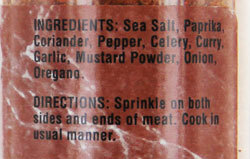 Ingredients: Sea salt, paprika, coriander, pepper, celery, curry, garlic, mustard powder, onion, oregano.